Create crossword puzzles and 14 more educational word games from your vocabulary words and definitions. 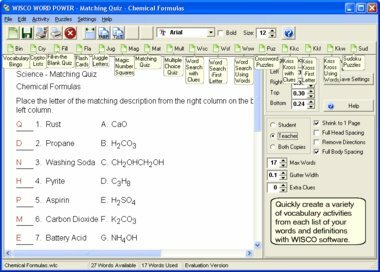 Automatic generation of vocabulary bingo cards, word searches, crossword puzzles, magic number squares, flash cards, matching and multiple choice quizzes, juggle words, fill-in-the-blank quizzes, cryptolists, and kriss-kross activities from your vocabulary words and clues. Vocabulary words and matching clues are entered once, and saved for future use. 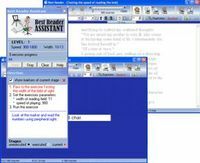 The program can automatically print out a variety of unique activities from each list. 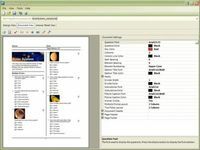 Combine word lists for review. Create sudoku puzzles. Make learning vocabulary fun. Includes many optional features: saving activities/puzzles as PDF, JPG, and BMP graphics, help letters, fit to one page, open or rectangular puzzle grids, help letters, word searches using words, clues, or first letters, and spell checker. Compatible with Vocabulary Power and Crossword Power from WISCO Computing.